Shall We Dance? 24×18″ pastel on paper by Marie Marfia, $645. I admit it, I’m a sucker for romance. Old movies, fairy tales, dancing with your baby after dark. I love all of that. How about you? Do you like to watch the same old happy endings over and over again? I think that’s why I love doing these skeletons. They aren’t embarrassed to get caught gazing into each other’s eye sockets. They just do as they please, and if that’s a beach bop on the shore in front of everybody, so be it. When I thought of the name for this piece, I immediately began hearing “Shall We Dance?” that song in “The King and I,” an old musical with Deborah Kerr and Yul Brynner. I used to watch that movie every chance I got when I was young, and then later with my daughter. I loved how they kept dancing faster and faster until Miss Anna was quite out of breath and the King of Siam had a particular look in his eye, maybe thinking, “Hmm, there’s more to this dancing stuff than I thought.” It sure seems to get the everyone breathing hard, doesn’t it? Of course, that’s not an issue when you’re a skeleton. You could dance all night and never get tired. If you’d like to purchase “Shall We Dance,” it’s available for $645. Contact me via email and I’ll get right back to you with purchasing and shipping info. New to pastels? Read about their care and feeding here. Shall We Dance? detail, 24×18″ pastel on Canson mi teintes paper by Marie Marfia. 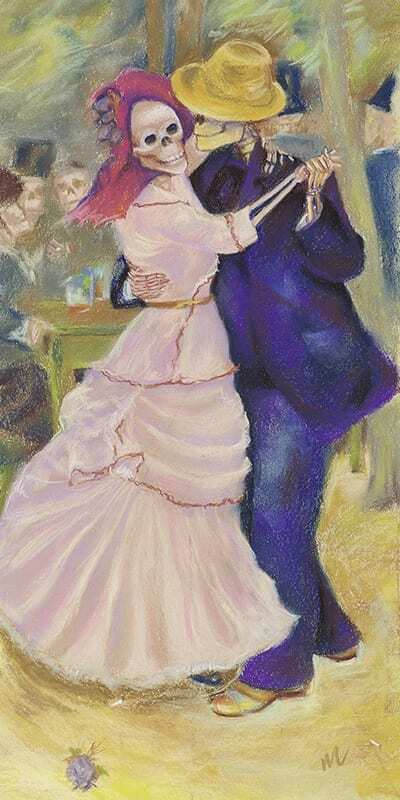 This entry was posted in A pastel a day, painting a day, Pastels, Skeleton, skeletons, Skelly dancer and tagged beach, couple, dance, romantic, Shall We Dance?, skeleton on September 16, 2015 by Marie Marfia. oh those orbs of sweet darkness, let me peer into them as we tread the light fantastic! Woot we? yessiree, sucker for romance! love this! Thanks, Liz! Orbs of sweet darkness, indeed.